I didn't wear makeup for the first ten years or so of my adult life. Oddly enough, I decided I should finally give it a try right before I started taking belly dance classes. I was mainly interested in the idea of playing with colorful eye shadows, but soon enough I realized that I was going to have to learn how to do makeup for performances. Once I started performing regularly, I got hooked on trying new products and reviewing them on my blog. Now I'm the go-to gal for a lot of my friends when they want product suggestions and technique advice. Though I am not a trained professional, I do my best to help them all look their best! Here are a few things I think every belly dancer should know about makeup. Yes, you need to wear makeup. Yes, for every performance. Yes, regardless of how good your skin is, or what your gender presentation is. You probably need to wear more makeup than you think you do. Unless you're already in the habit of doing over-the-top makeup with an airbrushed-looking complexion, heavy contouring, and perfect eyebrows, you'll probably need to apply it more heavily than your usual daily routine. There's no room for the “no makeup” look in belly dance. You need good coverage, good pigmentation, and rich colors. You need to learn how to apply makeup at different intensities. The Internet offers a large amount of advice on how to do stage makeup for intense lighting, to help the audience see your features from the back of the theater. You'll need that advice for when you dance on a big stage. However, in belly dance the opportunities to dance on a big stage tend to be few and far between! For smaller stages, make your makeup somewhat less intense. For a restaurant gig or other performances where you'll be close to the audience, make it just a bit more intense than what you would wear for a date night! Applying makeup is a skill. Like all skills, it takes practice! Give yourself time to work on your makeup skills, just like you do for your dance skills. You don't have to practice every day, but maybe once a week, just sit down with all of your products and pretend you're getting ready for a gig. With practice, you'll get better, and you'll get faster. If you let yourself experiment a bit, you might find new color combinations that you like. You don't have to spend a large amount of money to put together a good makeup kit. There are some decent affordable brands out there. NYX especially has some quality products that are bright enough colors for the stage. A lot of the other drugstore brands offer more subtle colors because they're designed for the average customer, but even so you can still sometimes get a great lipstick or mascara for under $10, or get some nice lashes for $3. PHOTO CREDIT: Photo by Carrie Meyer of The Dancer's Eye, St. Louis, Missouri. Quality is more important than quantity. It is better to spend more money on a few really highly pigmented eye shadows or one lipstick that you love than to buy a lot of cheap stuff that require layers and layers to make an impact! Take advantage of the internet. There are many online videos dedicated to makeup. You can't always trust the reviews because many of the reviewers are paid by the manufacturers, but you can find many tutorials for contouring, making a smoky eye, applying false lashes, and any other skill you could want to learn. 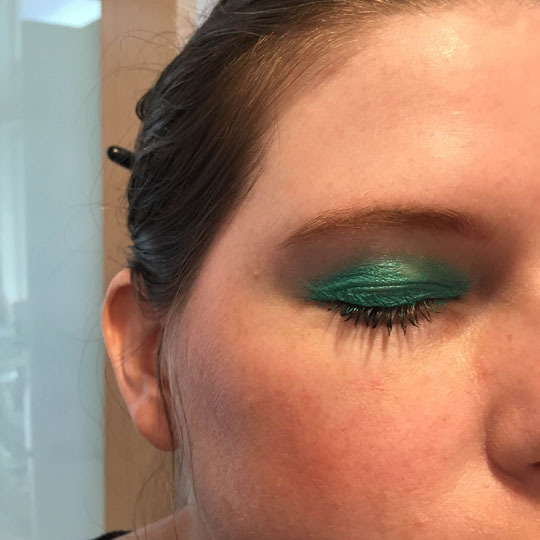 Not all of the looks are bold enough for the stage, but you can learn the basic underlying techniques and then make them suitable for stage with bolder colors and glitter! Makeup is not one-size-fits-all. Get to know the shape of your face, the shape of your eyes, any asymmetry, and figure out what flatters you the most. As an example, one of my brows is more arched than the other. I used to try to make them match, but it never quite came out right and I've decided to embrace the fact that my one arched brow makes me look a little inquisitive or skeptical! Speaking of brows, they are the frame of your face. Brow trends come and go, so I'm not going to tell you that you need to make them a certain shape or do them any certain way. Just... don't forget them when you do your makeup. If your brows are thin or pale, you'll want to do something to fill them in so they don't disappear when the rest of your face is made up. You'll want to pluck any errant hairs that are growing outside of your main brow area, so they don't interfere with your eye shadow. If you dye your hair a fantasy color, you may want to color your brows to match. Or you may even decide to go crazy and do glitter brows. False eyelashes are your friend. I know they're intimidating, and I know they're hard to apply until you get used to it – and even then, on some days, they're still hard to apply! But it's so worthwhile when you see how amazing they make your eyes look! Ease yourself into it with half lashes. They're a lot more forgiving, you don't have to worry about trimming them down, and they don't poke you in your tear ducts. They'll give you a little wing on your outer eye that will make you look all pretty and doe-eyed. I think I spent about six months wearing the half lashes before I became brave enough to try the full ones. Above all else, give yourself permission to have fun with makeup. Try an electric blue eyeliner or a bright purple lipstick or false lashes with glitter on them. Try them all at once! The great thing about makeup is that it washes off, so as long as you don't do something experimental 10 minutes before you need to be on stage, you'll be fine! Sophia Ravenna is a fusion belly dancer in the Seattle, Washington area. She began dancing in Tucson, Arizona in the mid 00s. Her primary teachers in Arizona were Cari and Tiffany of Anaya Tribal, and Jolie Roberson, although she studied with just about everyone she could, in a variety of styles over the years. Upon arriving in Washington, she immediately set about finding more belly dance classes, and is currently studying with Tempest and Kat Welsh. She can often be found on stage or in the audience at various local events in Seattle, Tacoma, Olympia and any other town within easy driving distance, including Portland, Oregon when she feels like a road trip. Sophia has a workshop addiction and loves to travel to attend events. She has studied with numerous instructors over the years but has found the most inspiration from Mira Betz, who taught her to take belly dance more seriously and dig deeper; Rachel Brice, who taught her how to practice smarter; and Lady Fred who inspired her to finally master the ¾ shimmies that have been annoying her for far too long. She is currently working her way through Rachel Brice's 8 Elements training. In addition to belly dancing, Sophia enjoys costuming and makeup. Outside of dance, her favorite thing to do is curl up with a good book and a fluffy cat.